Reimbursing patients should be easy. Yet, often enough, it is one of the most challenging programs for sponsors to implement. When comparing reimbursement options, make sure your program isn't lacking these five essentials. With many programs, it can take up to 20 minutes to reimburse a patient. At BBK, it's simply one. Consider this: 20 seconds of setup, 20 seconds to reimburse, and 20 seconds for the funds to appear on the patient's card. The bottom line: Minutes add up. Find a program you can count on. And by count on, we mean one that positively impacts your study. On average BBK sees an improvement in patient retention by 67% when compared to other programs. Offering global coverage and having a system in place are two different things. Set your study up for success with a program that has a full global infrastructure all queued up and ready to go. That way, no matter the size or scope of your study, it is ready to launch with the currencies, languages, and countries you need. Simply put, you need the facts. Any strong program should deliver one-stop-shop reporting by country, site, and de-identified patient, so you can make smarter decisions faster. A transparent system makes complicated reimbursement easy. Know what's been paid to whom, for what, and when. Sites know what to reimburse for and monitors know that they're complying with the ICF. Make it shine. Consider a program where patients don't even need to provide personal information (such as their Social Security Number). But wait, there's more! 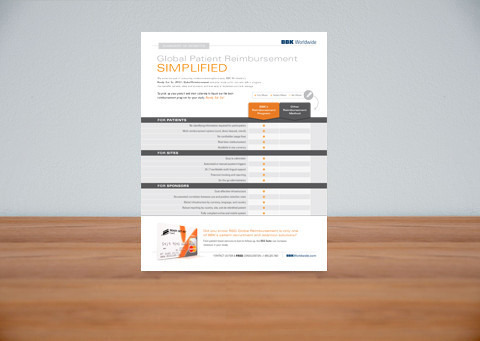 Click here to use our worksheet to easily compare the benefits of a successful patient reimbursement program.